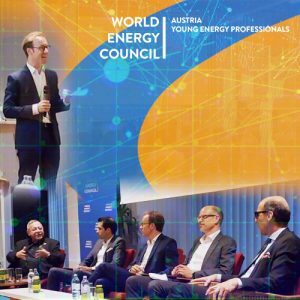 At an event held on 24 October 2018, Young Energy Professionals (YEP) Austria presented the results of YEP Working Group 4 on digitalisation in the energy sector. The focus was on the significantly increased dynamics of change as a result of technological change, which is often subsumed under the term digitalization, and the associated implications for the energy industry. The presentation of the working group results was supplemented by an insight into the digitalization activities of Wien Energie GmbH and rounded off by a panel discussion with prominent speakers. In the final report, the effects of digitalization on Austria’s energy industry with regard to the expected advantages and disadvantages are shown and the future requirements for regulation and market design are presented. In addition to a survey of the current degree of digitalization, the opportunities and risks of new business models are also considered. The effects of digitalization on future corporate structures and the problem of a shortage of skilled workers are also discussed.